The Philippines is a well-known holiday vacation spot in Asia as a result of the marvelous nature attractions, interesting culture, and delightful cuisine. People who travel to Philippines are amazed with the locals’ hospitality and genial character. You can easily get by in the Philippines because many Filipinos are fluent in speaking and written English. Foreigners can ask assistance from the particular locals in relation to the directions or travel guidance. The following are among the most frequented travel destinations and places to visit in Philippines. The Rice Terraces located in Banaue were declared by the UNESCO World Heritage Site. This famous landmark in the country was carved by the Ifugao natives centuries ago. They used their bare hands and some sticks in creating this majestic terrace. The primary function of the rice terraces is to cultivate the land for planting rice, a type of grain that is a staple in Filipino meals. Travelers can get to the area by car for 12 hours from Manila, the country’s capital. The Tubbataha Reefs are located in the Sulu Sea, which can be accessed by boat from Puerto Princesa, province of Palawan. The government conserves and also protects this national marine park. It is also part of UNESCO’s World Heritage Site, and it is a popular diving site in the country. 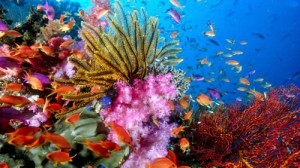 The Tubbataha Reefs feature over 1000 species of birds and underwater animals. The Paradise island is located in Davao, a province in the southern portion of the Philippines. It features a relaxing feel that appeals to visitors that look for a relaxing tourist spot. Paradise Tropical isle boasts of fine, white sand beaches and beautiful waters. Numerous recreations are famous on the island such as scuba diving, swimming, beach-walking, and snorkeling. Animal lovers will delight in visiting the zoo park that is located within the island. Numerous exotic species of plants as well as trees also grow lavishly in the zoo park and forest. Chocolate Hills is a well-liked tourist attraction because of the impressive chain of 1,800 hills. Chocolate Hills got the name because of the rich, brown color of the slopes that fill a vast land area along with 20 mi2. People that plan to check out this picturesque spot can drop by a viewing station located in Carmen, Bohol. There’s also mountain resorts where travelers may have an overnight stay and enjoy the fabulous dish and sights in the province. In Boracay Isle numerous tourists are typically awed by the tremendous perspectives and various amusements that the island is putting forth. The island, which is arranged in Aklan area, is one of the surely understood shorelines in the world.People on holiday vacation can look over two noteworthy shorelines that offer remarkable sights, for example, the Bulabog Beach and White Beach. Both these areas give white sand shorelines, clear waters, and world-class inns. Travelers can take an interest in various relaxation exercises including kite surfing, scuba plunging, playing golf, kite boarding, swimming, sunbathing and nature running. After a tiring experience, tourists can browse the specific wide assortment of eateries and bars situated inside of the beaches. The Philippines offers all that you could ever crave on a heaven getaway from walking around sandy white shorelines to scuba diving adventures. A travel to Philippines spots will give you the chance to investigate the charming mountains and tropical warm waters a seemingly endless amount of time. Visit Philippians for an immaculate approach to make recollections that will endure forever.